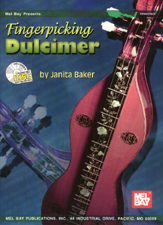 Dulcimers are NOT available to order online. If an item does not have an "add to cart" button next to it, it is not available to order online--you'll have to contact us by phone or email. We are happy to be able to offer you the convenience of online ordering through PayPal. Please note that you do NOT need a PayPal account to place an order; you can use your VISA, MasterCard or Discover credit card as well. Because of the way PayPal is set up, it is difficult to compute accurate shipping charges. If the submitted shipping charge is in excess of what it should be you will be refunded the difference. In most cases, USPS Priority is a better shipping option than surface rate and may only cost a little bit more; it is faster and these days seems to be more reliable. We do our best to have all items in stock and ready to ship when your order arrives. If we cannot ship your order within five days we will notify you. If Janita is out of town (she's the shipping department) your order will ship when she returns. You can always check her calendar to see her schedule. Sorry, no online international sales for books or cd's accepted at this time; please call or email us. Shipping Charges: all accessories ordered and shipped with an instrument will ship at no extra charge except in the rare instance where an accessory order is too large to fit into the same box as the instrument. In that case, additional shipping charges will apply as noted below. 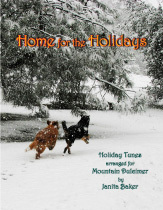 A collection of 41 arrangements for mountain dulcimer for Thanksgiving, Chanukah, Christmas and the New Year. The arrangements range in difficulty from novice to advanced and include fingerpicking, flatpicking and basic strumming styles. Spiral bound; 84 pages. * Songs noted with an asterisk are arranged for four equidistant string dulcimers. This is an acoustic collection that celebrates the season with a great balance of light-hearted parody and lovely old country traditionals, with just a touch of delta blues and acoustic swing for good measure. 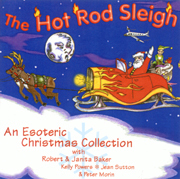 Robert Baker on guitar, National steel and lead vocals; Janita Baker on mountain dulcimer and autoharp; Kelly Powers on fiddle, mandolin, accordion and harmony vocals, Jean Sutton singing harmony, and Peter Morin on dobro. 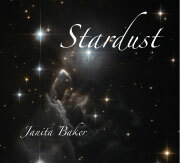 A collection of mostly instrumental arrangements featuring standard, bass and the 5 string AJ baritone dulcimers, Janita is accompanied by Robert Baker's vocals and guitar on three of the selections: Ain't Misbehavin', Paper Moon, As Time Goes By; Robert's guitar accompaniment on A Nightingale Sang in Berkeley Square, and by Robert and Sarah Elizabeth (playing bass dulcimer) on Lennon & McCartney's beautiful love song, I Will. 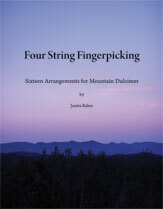 Sixteen arrangements for four equidistant string mountain dulcimer ranging in skill level from advanced beginner to advanced player. 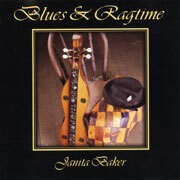 Many of the arrangements can be heard on the Solace and the Blues & Ragtime CD. 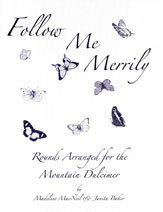 Thirty four rounds arranged for the mountain dulcimer and suitable for all skill levels. "Playing rounds is a wonderful way to experience the magnificence and beauty of harmony; it can unify a group of players with a synergistic performance, one in which the individual players cease to be individuals and become one with the music." Book w/ Online Audio $23.00 Access to songs by online access code included with book. Fifteen arrangements for four equidistant string dulcimer. The arrangements are accurate transcriptions of the songs as performed on the Blues & Ragtime CD and are suitable for intermediate to advanced fingerpicking skill level. Recently released by Mel Bay Publications, this book has been out of print for several years. Primarily an instrumental album featuring mountain dulcimer as the lead instrument, this recording combines classic piano rag selections with delta and country blues performances to explore two of America's most recognizable musical roots. Several tunes feature guitar and vocal accompaniment, but the dulcimer always remains clearly up front. 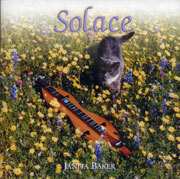 Displaying the versatility and depth of both the mountain and bass dulcimer, Janita Baker's fingerpicking arrangements are a true measure of the dulcimer's capacity to perform complex music in an elegant and easy-to-listen-to style. An all-instrumental fingerpicking dulcimer album, this recording presents a wide variety of musical styles performed on standard and bass dulcimer. The dulcimer is accompanied by guitar on Wylla's Waltz and Cry Me A River. 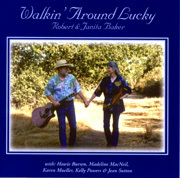 Acoustic guitar and vocals performed by Robert Baker and accompanied by Janita Baker on mountain dulcimer. Guest artists include Howie Bursen on banjo and vocal, Karen Mueller on Autoharp, Kelly Powers on fiddle and accordion, and Madeline MacNeil and Jean Sutton on vocals.